This site is provided by Click Workshops on an as is basis. Click Workshops makes no guarantee as to the currency, accuracy, or quality of information published and/or archived on this website, nor will Click Workshops accept any responsibility for other organizations, businesses, and private persons that provide information on this website. All information on this website regarding services provided by Click Workshops is subject to change without notice. Reasonable efforts are taken to ensure the accuracy and integrity of all information provided here, but Click Workshops is not responsible for misprints, out-of-date information, or errors. Click Workshops reserves the right to limit purchase and purchase quantity of workshops. In the event of any site error, customer will be limited to a single unit purchase. Pricing on this site may be subject to change without notice. By accessing this site you are agreeing to all of the terms, conditions and statements included in this legal statement. The entirety of this site or any portion of this site or class content may not be reproduced, duplicated, copied, sold, resold, or otherwise exploited for any commercial purpose that is not expssly permitted by Click Workshops. The Click Workshops site or materials may not be linked to any other site without prior consent of Click Workshops. Click Workshops and its affiliates reserve the right to refuse service, terminate workshop reservations, and/or cancel workshops at its discretion, including, without limitation, if Click Workshops believes that customer conduct violates applicable laws, disrupts our normal business activities or is harmful to the interests of Click Workshops and its affiliates. Click Workshops reserves the right to cancel or reschedule workshops in the event the minimum number of participants for a class has not registered for a workshop within two weeks of the workshop’s scheduled date. Registrants will be notified within 1 week or more of the reschedule. Cancellations, reschedules, or refunds will be allowed with at least one (1) week notice prior to the registered workshop. No-shows or cancellations in less than 1 week notice will forfeit the registration fee. Requests for reschedules or refunds in less than one week prior to the class can be honored for 50% of the class purchase price or 100% of the groupon price (if the original reservation was made using a Groupon). There are no exceptions to this policy. Click Workshops owns the copyright in all of the content comprising this website and materials distributed during classes, unless otherwise indicated. By accessing and using this website and/or attending a workshop, you agree to abide by U.S. and international copyright laws and all other applicable laws. Any other use, including the reproduction, modification, distribution, transmission, republication, display, or performance, of the content on this site or in workshop materials is strictly prohibited. Permission may be needed for other content not marked with Click Workshop’s or any copyright notice. You may cite or refer to the URL of this website without limitation. All brand, product, service, and process names appearing on this website are trademarks of their respective holders. Reference to or use of a product, service, or process does not imply recommendation, approval, affiliation, or sponsorship of that product, service, or process by Click Workshops. Nothing contained herein shall be construed as conferring by implication, estoppel, or otherwise any license or right under any patent, copyright, trademark, or other intellectual property right of Click Workshops or any third party, except as expssly granted herein. By registering for a workshop with us, you are consenting to receive e-mail from us regarding your registration or your order. Additionally, by registering or placing an order with us, you are consenting to receive commercial e-mail from us. 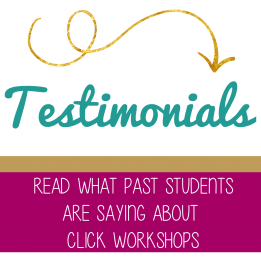 If you do not wish to receive commercial email from us, you may remove your name by emailing to jody @ clickworkshops.com. Your receipt of an electronic or other form of order or workshop confirmation does not signify our acceptance of your order, nor does it constitute confirmation of our offer to sell. Click Workshops reserves the right at any time after receipt of your order to accept or decline your order for any reason. Terms of payment are within Click Workshops’ sole discretion, and unless otherwise agreed to by Click Workshops, payment must be received by Click Workshops prior to Click Workshops’ confirmation of reservation in a workshop. Payment for the workshops, products, and support may be made by credit card. We may require additional verifications or information before accepting any order. Click Workshops continually upgrades and revises its offerings to provide Click Workshops customers with new service offerings. Click Workshops may revise and discontinue products at any time without prior notice to customers. You agree that any legal action brought against Click Workshops shall be governed by the laws of the State of Alabama, Georgia, or Pennsylvania without regard to its conflict of law principles.